I found this recipe online. Soon, we who live in the Midwest will have to harvest our basil. This sounds like a good, quick meal to use some of that basil. 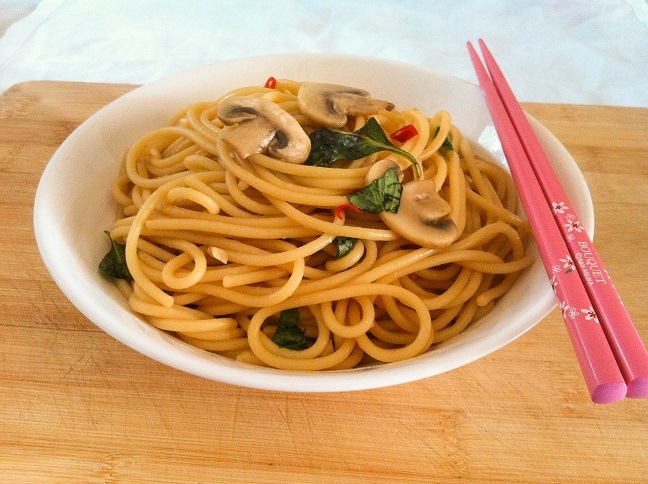 Garlicky, buttery, slightly spicy noodles tossed with sliced mushrooms and refreshing basil for a tasty Asian inspired dish. Each bite will be bursting with flavors, keeping you hooked until there’s nothing left on that plate. In a medium sized pot, cook the noodles in boiling water according to the directions on the package, around 8-10 minutes, until al dente. Reserve about ½ cup of pasta water. Then drain the pasta, run the noodles through cold water to prevent the noodles from continuing to cook and from sticking to each other. Set the pasta aside for now. In a large pan, add butter and stir with a spatula to melt it. Once the butter has melted, add the minced garlic. Use a spatula to stir to prevent the garlic from becoming burnt. Cook the garlic until it begins to turn golden brown and becomes aromatic. Add sliced mushrooms, and cook them until they have softened. Pour in the reserved pasta water to create the sauce. Add the pasta, basil, and chili pepper. Stir to evenly incorporate the ingredients. Add the tamari soy sauce in the pasta and mix to evenly distribute the flavor. Sprinkle a pinch of salt for added flavor. Serve the pasta warm or cold, depending on preference.